Has anyone read Andrew's books? His book Hand Psychology is on google books. Apparently he has been in prison for about 10 years for murder. He may be innocent, if so it is rather disconcerting. I've got Hand Psychology, it's a good book. Thanks for google book link for those who don't have it, it's well worth reading. I wish I'd bought "The Palmists Companion" when it was available / affordable! There is a thread about Andrew Fitzherbert conviction here. Palmistry, your career in your hand, The Aquarian Press, 1989. Thank you for the recommendations and links. I wonder whether there is anything that the palmistry community can do to mobilize his case? a petition of sorts? or (unfortunately for the biased Australian justice system) could it make it worse? Of course there is a chance that he is indeed guilty, but somehow it doesn't seem likely to me. "The Palmists Companion" is indeed expensive! Manfred, do you think the material in "Palmistry, your career in your hand" is covered to a large extent in Altman latest book "Palmistry, Universal Guide"? Boaz, Hand Psychology is an excellent book, written (I feel) with experience and integrity. I find it lucid and informative. In fact, it is one of my top five, particularly since I am interested in palmistry is it relates to personality and psychopathology. Although Andrew doesn't deal much with the latter, he does describe the neurotic personality and what signs to look for in the hand. I can't compare those two books because I didn't read Altman latest book "Palmistry, Universal Guide". 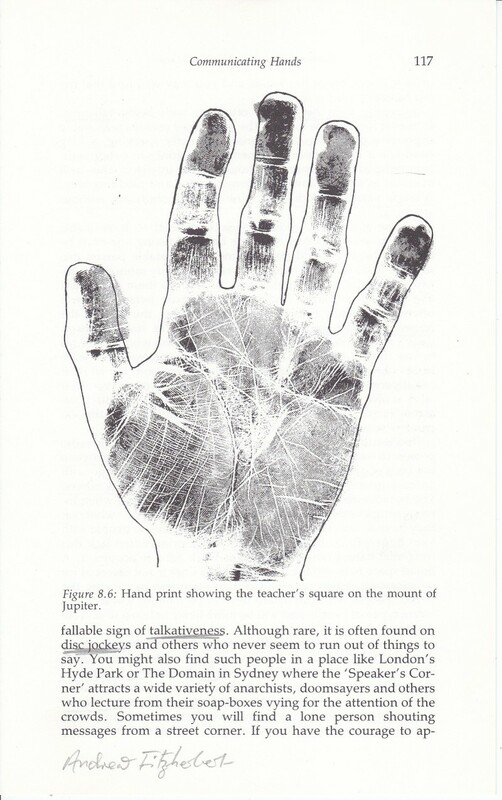 Just curious to know whether any of you has his hand prints or pictures through any means . . like from his intimate palmistry friends or from his books ? We can read his hand if we get his hand prints. . . wondering how a renowned palmists missed to foresee his own fate? stalin, what a great question! I know several people who know Andrew, but I don't know if any of them ever saw his hands/ handprints. It would be very interesting to see Andrew's hands. I have a print of both, but I'm not authorizised. But one palm is in a book. I'll put it in soon. The left hand shows a doubble headline. Thanks for posting it Manfred. Extremely interesting hand which i never come across before. . . I tell my comments late tonight. . . All the fingers are spatulate type which i have never come across. . . This shows intelligence in all the field and aspects. However, could notice, kind of square in jupiter and moon may show the imprisonment nature.. and also could find some confused lines . . . I am here to present my interpretation and findings , on fitzherbert's palm. Infact, I have no idea about this person except that he is a author and renowned palmist. 1. Wow..! spatulate fingers. . . . In my opinion, This type of finger should be classed as first grade one. He should be well termed as intelligent and talented in all areas of life and profession. This finger type shows intense desire to travel all around the world. Keywords are zeal, ardent, restless, man of action, exploration, innovation. Each spatulate finger shows a special talent and interest on particular field or profession. His each finger is waisted in between the joint knit. It shows the analytical and reasoning mind. Infact, we can write a special essay about his finger alone. Note the crooked index finger. . . I seriously dont believe crooked finger peoples.... At the meanwhile, his index finger seems to be pointed at the tip. . . It is peculiar. . . it gives spiritual and clairvoyance touch to this person. But, the whole theme of index finger lost it's good quality due to it's crookedness. I would say that behind the screen they have lead sinful acts.. Definitely it must be a personal secret which could be a disgusting or sinful act with the background of religion or spiritual. 2. Wow! what a thumb.. will portion thumb is being double the size of logic part. . . I wonder how confident in his action. . . Confident- force- practical-doer. Also a spatulate thumb shows his deep interest on spirituality. 3. Unique location of Fish sign present in his hand . It shows that he had accumulated great wealth from his profession. 4. Grill sign on palm anywhere except on venus tempt me to think always about imprisonment. I see the similar expression in his jupiter and moon mount. 5. Blood line present- A branch of heart line cuts his begining of the head line. It represents suicidal tendency and disappointment loves. He also seems to have sad childhood. Infact, he might be tried to kill himself at his early teenage or before. 6. He also seems to have lack of peace in family life as evidenced by his heart line. 7. He is a spendthrift. Although he earned lots of money, it wont be sufficient for him . Though he succeed in his profession and got higher posts. 8. Mercury line cuts the life line. Indicates definate heart trouble. . . Even death by heart attack at the old age..
10. medical stigma- It is the indication of service minded, In his case, nearly 5 lines- indicates well learned. mercury line and travelling line are also indicating overseas frequent travels . 11. He also may have lost few of his family members, due to their early death. It is said to be happen due to the curse.